A friend of mine has a Windows phone, and it’s weird. Unlike me, an Android-devotee who obsesses over the latest and greatest mobile devices, she just went with a phone that was recommended by a sales person when she renewed her plan. I asked her if she liked her phone and she shrugged: “It makes calls, it texts, it has Facebook and Twitter. It’s fine.” She was eager to change the subject since she didn’t care. And I wondered: is this the user base for Windows Mobile smartphones? People who don’t care about the mobile experience? Here at the Farm, Windows Mobile is almost a dirty word. No one uses it, and thinking about it makes us shake our heads. After all, the Lumia series is excellent hardware and a part of us really want to develop apps for it and the OS. But the clients requesting development for Windows Mobile has dried up. And as it takes time and effort to develop for a third OS after the big two, we’re hard pressed to recommend porting our clients apps to the also-ran. We can’t even say it’s an afterthought; Windows Mobile isn’t a thought at all. The industry as a whole seems to agree. By late 2015, the market share for Windows phones dropped even further, to 1.7% in the 3rd quarter and 1.1% in the 4th. And remember, this is on the heels of a year of Windows 10 taking over the PCs of the world. Windows 10, which was optimized for mobile, was supposed to be the big push to get more people using Windows phones, but that hasn’t materialized. In 2016, Windows 10 is predicted to reach 400-500 million PCs and sales of the Surface tablet will probably still beat out the iPad as it did in 2015. Some are pointing to these facts as signs of life, but we don’t buy it. Ok, let’s say that their market share doubles. That would bring it up to 2.2%. Still not anything to get excited over. Businesses still won’t spend the time or money developing apps for this OS, especially when Apple and Google are continuing to add more options to their stable with wearables, VR headsets, and even automobiles. And at this point, Windows isn’t playing catch up as much as trying desperately to hold on to the apps it has. In the past year, the Verge reported that American Airlines, Chase Bank, Bank of America, NBC and Pinterest have all discontinued supporting their apps on Windows Mobile. Their version of Instagram is still in Beta after two years on the market! The cycle goes like this: fewer apps means fewer phones sold. The fewer phones sold, the fewer apps are made or maintained to a high quality. 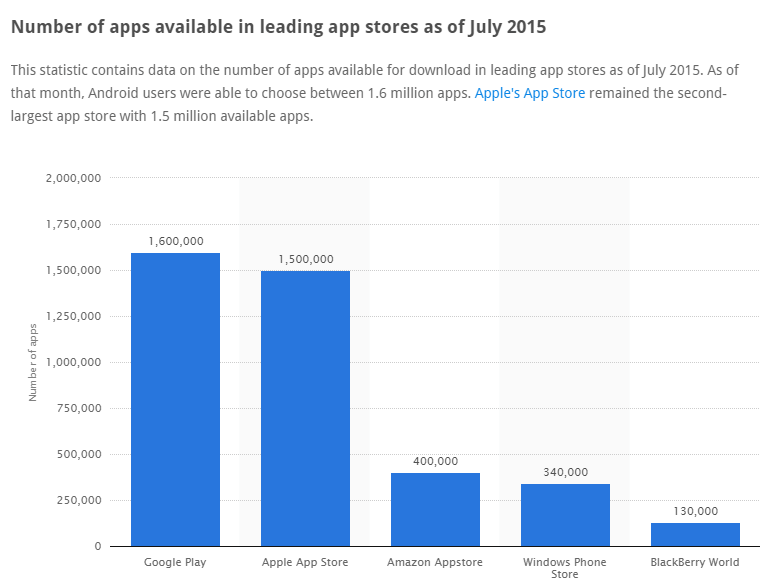 People frustrated with shoddy or non-existent apps switch to Apple or Android. And so on. Then, include the fact that fewer programmers are willing to learn or keep up their skills developing for Windows, and you’ve got the makings of a death spiral a lot like BlackBerry. Somehow, Microsoft has made their tablets a mild success. Enterprises are embracing the Surface and they’re outselling iPads, as previously mentioned. By building quality hardware (and that NFL snafu was a network problem, not the tablets themselves! ), a pretty solid touch-enabled OS, and lots and lots of marketing, they’re making headway. But that strategy won’t work for phones. Why? Because as we said in another blog post, tablets are for enterprise use, not for your average consumer. And the average consumer wants reliable phones with all the apps that they’re used to. Without the support of 3rd party developers, Microsoft just can’t deliver on those needs. The only thing they can do is double down on Windows 10 and hope consumers will make the switch, but that’s less a strategy than wishful thinking. …maybe one last ditch effort. At the end of the day, Microsoft’s best hope is to win the enterprise market. Follow the Surface’s success by pushing a similar smartphone to users already familiar with the tablets. And sure enough, the Surface phone should be out soon. If the phone can hitch a ride on the backs of the tablets, and sneak their way into the homes of these businessmen and women, then it might have a chance. But, in our opinion, this isn’t going to move the millions and millions of Windows phones to stay competitive. And I have a feeling my friend might not even have the option to get another Windows phone in 2 years, when her contract is up. What do you think about the state of Windows Mobile? Sound off in the comments below!